As a mother I love trying new recipes and sometimes it can be hard to sit down in front of a computer and look around for something new. Plus, I really don’t have the time to write the recipe down and forget printing it and I have no intentions of bringing my laptop in the kitchen when I am cooking... Oh man, Can you see that disaster? Because I sure can! So here's the thing, I shop at Walmart all the time. It's convenient and I can get in and get everything I pretty much need and I'm done. Recently my Fiance and I decided to check out Walmart Family Mobile. We figured it was worth a shot and a much more affordable option for us. Data plans can be expensive. I am sure we all know this! Every company is different and we just wanted something that would work for us. Our current provider wants an arm and leg for unlimited data, literally. It's just down right crazy!! 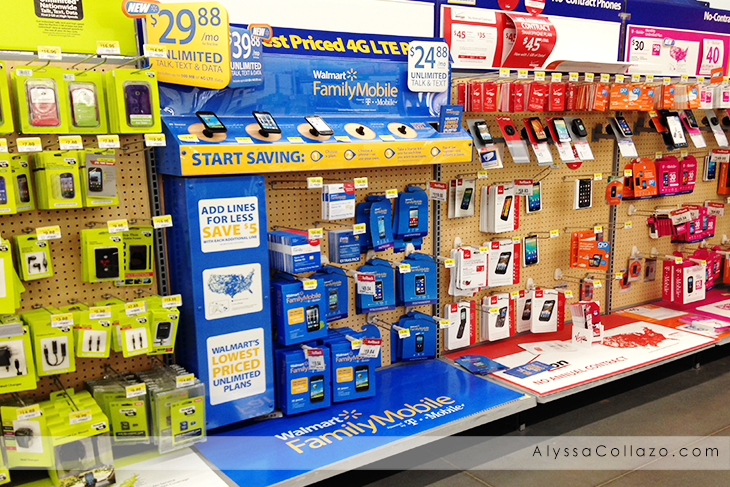 Walmart Family Mobile is a much more affordable option. Instead of paying an arm, leg and probably a kidney for service, with Walmart Family Mobile I simply pay $29.88 a month for Unlimited Talk, Text & Data. Yes, you read that right! And let me tell you, my fiance is ALL for it! I am big on using my data plan for browsing the net. I mean I have 2 girls that I love to shop for and I am huge fan of Pinterest. This is the perfect option for my family. There is no going over your monthly limit and getting hit with a $600 cell phone bill. No stressing if you used all the data and someone else didn't get to use any! And I get even better service thanks to Walmart Family Mobiles 4G LTE service, which includes up to 500MB! One of the main things I use my data plan for is looking for new recipes. I don't mind bringing my phone into the kitchen because it's a small device that I can put it up and not worry about it getting flour, egg, milk, water and any other cooking ingredients on it! It gets boring when you eat the same meals over and over again and don't get me started on desserts, you can only eat so many of the same cookies, haha! I also want my family to have good meals that aren't boring and are new. Well, with Walmart Family Mobile I can use my data plan to browse the net how I want and when I want. 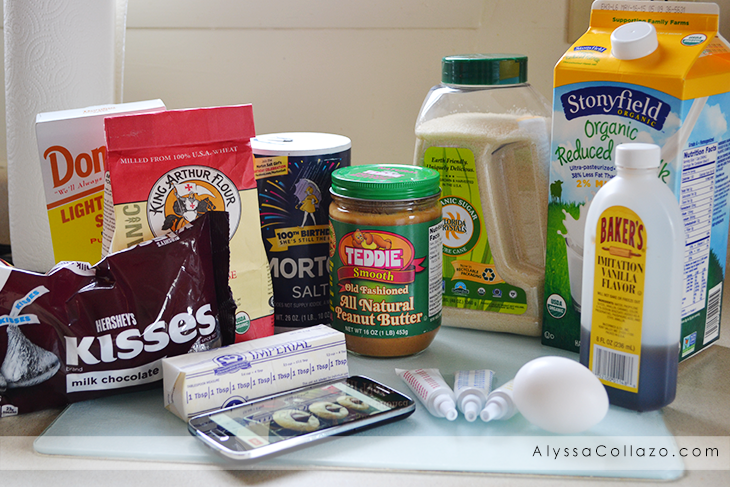 I can find the recipes I want and get to cooking with my phone by my side. Which now bring me to this. While using my Walmart Family Mobile service and Samsung Galaxy Avant, I found this recipe and I wanted to share it with you all. 1/4 cup granulated sugar - I used colored sugar, to make this simply Place sugar in resealable plastic bag. Add 5 drops of food color for pale colors. Spread in a thin layer on a baking sheet and break up any large lumps. Allow to dry thoroughly, about 15 to 20 minutes. I used 2 different colors. Preheat oven to 375 degrees. 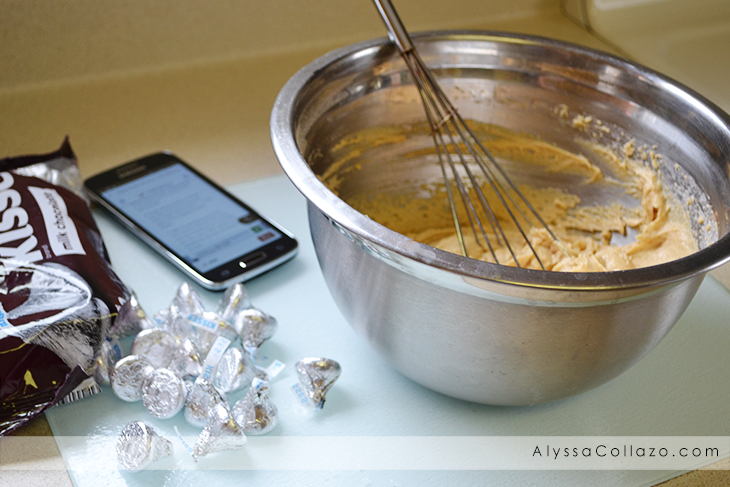 Remove wrappers from chocolate kisses. In a large bowl, cream butter or shortening and peanut butter until light and fluffy. Gradually add 1/2 cup granulated sugar and brown sugar; beating until light and fluffy. Add egg, milk, and vanilla extract; beat well. Add flour, baking soda, and salt; stir into creamed mixture until well mixed. Shape dough into 1-inch balls. Roll in sugar and place on ungreased cookie sheet. Bake 8-10 minutes, until lightly browned. 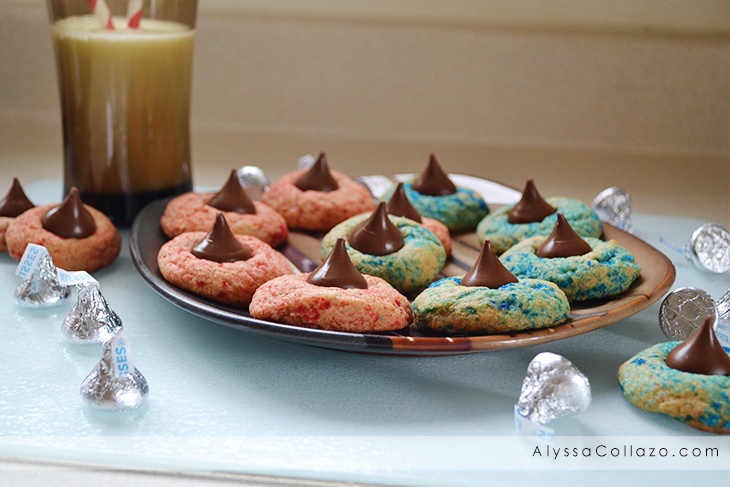 Remove from oven and immediately press a chocolate kiss into the center of each cookie. Remove to a cooling rack to cool completely. Voilà! 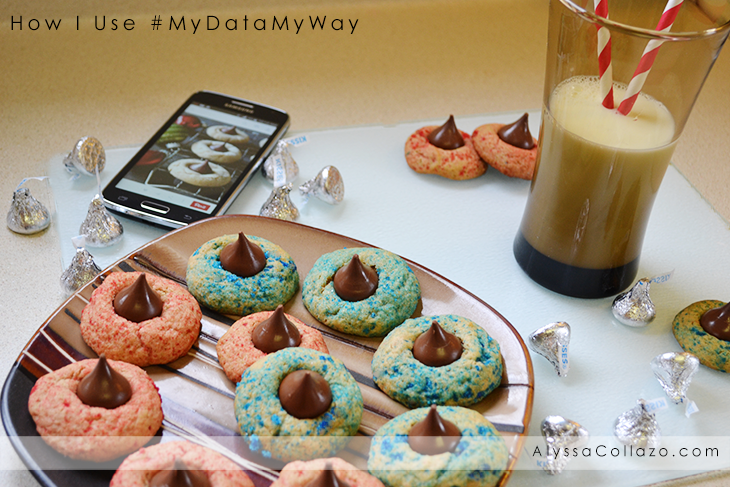 My girls loved these colorful cookies and guess what my Galaxy Avant stayed nice and clean! Be sure to check out more great phones and the fabulous Walmart Family Mobile service by visiting their website. I am under contract right now, but this sounds like something I want to look into once my contract expires. It sounds like a great way to save. I wish we had this at our Walmart. I can't even explain the level of frustration I'm at with my current provider and data. Even with our data switched off we are over $100 this month, awesome. Gorgeous cookie photos! I love that! I've heard of the Walmart Family Mobile. We are under contract but it sounds like it would work for a lot of families. I need to look at this for a new phone. I love making new recipes. I've not heard of this service by Walmart before. Thanks for sharing. Not to mention your recipe looks amazing. I'm really impressed with the Walmart plans that I've been seeing. The ability to customize my plan is so great! I haven't checked out Walmart's plans on phones yet but your cookies look amazing! Love the recipe. I love that there are so many great options in cell phones. I would look into them if I wasn't tied to a contract. I do the same thing with my phone. It's just so convenient to look up recipes with one hand while working on something else. Those cookies look so yummy! Love WFM! Sounds like a really great plan. Thanks so much for the recipe too! Looks really good! I need to get more out of my smartphone other than playing games and checking email. I never think to use it for recipes a you did. I don't go to Walmart often but I've never heard of this service...which is a great service by the way! And can I say that those cookies look delicious! I love peanut butter blossoms! And those fun colors make them so pretty! I use my phone to find recipes, too, and I'm constantly Googling something or other. I've never heard this service? this is a great idea too, I might need this one day. Wow, Walmart is entering the "data plans" scene? For sure they could become a game or price changer! I absolutely love and I'm grateful with how technology & the internet are making our lives easier. The convenience these bring us have certainly changed the way we do things and the way we live. It's great that Walmart has this. The cookies that you made look delish! I've looked into this for my daughters. I like how affordable and straight forward the plans are. I have been reading a lot on the Walmart data family plan. It is awesome to be able to look up things on the phones at anytime. I will have to try making these cookies with the kids and they would love the added colors. Thanks for sharing. My son would love those sweet treats! I think the next time our contract ends at AT&T, I will have to try the Walmart Data Plan. This is really interesting - I didn;t realize that Walmart has their own plans! I live in Canada so I don't think it's available here but I'll keep my eye out just in case! Those cookies look delicious! I wish I could go back and not get AT&T and get a prepaid service like that to save money! I was actually thinking of switching to that plan as it is so much cheaper then what I have now, but i havent decided yet LOL. BTW those cookies look so scrumptious!! Great review!! This sounds like a great alternative to normal/big name cell companies. My husband and I are currently on T Mobile so we have the unlimited but it is a little pricey. The cookies look really pretty! I'll take two, please. One of each color. :) I am so glad to see more affordable cell phone plans out there. I wish I could get my husband to switch. Those cookies look AMAZING! I love King's Arthur Flour, it's so good! I'm almost out of my dreaded contract with Tmobile and have been looking into the easy plans at Walmart. I'm so tired of being bond to a contract especially when we don't use even half the limit we have. It'll be nice to save some money on our phone plans. I need a new cell phone plan that doesn't cost an arm and a leg. I need to check out WalMart's plan soon! What a great deal that is. Our provider is definitely charging us an arm and a leg for our plan and we don't even have an unlimited data. Yummy! I'm usually not too much of a chocolate fan, but looking at those kisses make my mouth water. I'm off to the cupboard to look for chocolate. Interesting, I've never checked out their plans. I was with Metro PCS for years and then got locked into a Verizon contract. I can't wait to be out of that thing in a few months so I can look into cheaper options! These cookies look so delicious. I will have to make some this weekend. Walmart has a great wireless department. What speeds do you get after you use the 500MB? I know a lot of unlimited plans drop you to 3G after a certain amount and some even go slower than that. I've heard great things about these plans. I know a few people who use them. I've never tried one though.